is there anywhere that describes step by step how you raised the harp ? 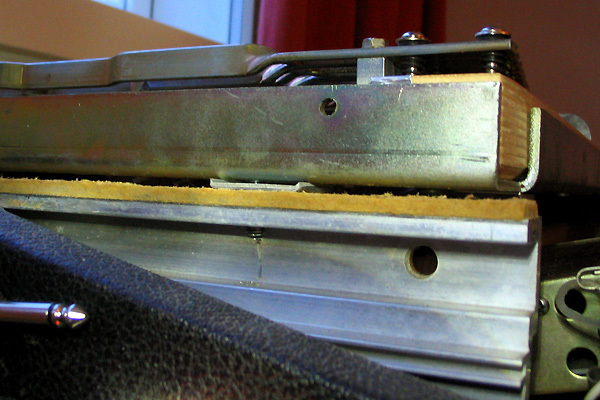 You just insert a shim between the harp support and the harp. I inserted these metal bits shown in the pics below (sort of square shaped washers, with a little ramp at each end) originally from an Ikea shelf wall mount - it was supposed to be a temporary solution to just quickly try it out, but they seem to do their simple job very well and the height seems to be about right - so at least for now I'm sticking with it. Unless there is a specific reason for me to make brand new wooden shims? First I tried putting them just on the left side, but ended up putting them on both sides cause I preferred the sound that way. Another tradeoff to mention is that the lightest key strokes produce no sound, as the hammer doesn't quite reach the tine. But this only happens with Very light key strokes and overall I prefer it this way, I really love the barkier early Mk1 sound.. I just tried this on my sparkletop. I have a damper/hammer assembly and harp supports scavenged from a Mark I. I measured the height of the harp supports and found that the bass end was 1/4" taller. On the sparkletop there was only a 1/8" height difference on the harp supports. So I experimented with shims on the bass end only. First try was a 9.5mm shim and hammers would not strike the tines. I then tried a 6mm and the hammers worked although the dampers need to be adjusted. It did have a positive impact on the sound. It resolved one of my complaints about sparkletops - the bass notes don't have the "furry" tone of the later pianos. This shim brought out that "furry" sound - I *LOVE* it. 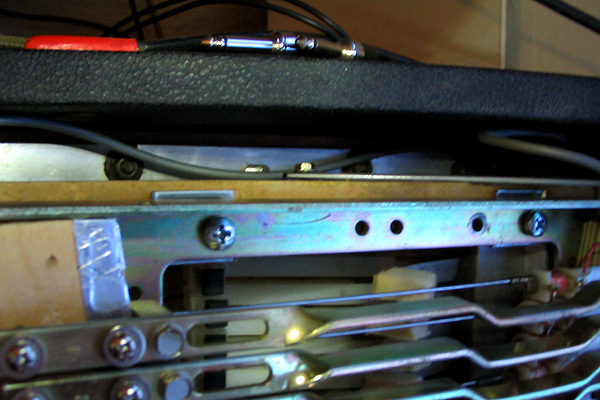 One big improvement is I don't have to play very hard to get that furry sound, so a lighter touch means a lower risk of breaking the unobtainium Raymac tines, especially the longer ones for bass notes. The other improvement is it eliminated the "wolfy" tone of some of the bass notes, now they ring pure. The middle notes had a slight change in sound, the top notes sounded no different. The top 2/3 was my favorite area on the sparkletop, now with the shim the entire range is optimal. I'm making this shim permanent. Finished the work this weekend. Adjusted the dampers and one of the bridle straps came off a hammer. Much cussing and whining of teeth followed. Took out the hammer and damper arm (both are secured with a single phillips screw, easy to remove) and it was a simple fix - the folded part of the bridle strap still had the super glue intact and I was able to slip that fold back into the groove in the hammer. BE CAREFUL when adjusting dampers on a sparkletop! Big improvement in the bottom half of the piano, the tone is much better. The bass notes have that furry tone and the middle notes have more bark. Highly recommended for 1960s sparkletop and "jetsons" student pianos. Finally! A clip from 1965. Dave Rowberry of the Animals plays a Rhodes on American TV!Check it out! Rhodes Supersite Lead Historian, Content Provider and Scandinavian Rhodes-Tech since 35 years. What a find again Freddan ! Very important ! Thanks! It appears that no-one has posted any videos of Cinematic Orchestra, so I'm happy to be the first. Great Rhodes sound, great everything!! Some great examples of Mark V playing are by Marcin Grochowina. He's a German pro who goes by jazzijazzful on YouTube. He has several solo jams of the highest order: rhodesfive ver. 1,2,3 and Rhodes Mark V.
Hey folks, here's a little clip of my space-funk-fusion trio The ElecTrio. Playing my custom Mk2 Rhodes. Hope you dig! Really nicely done! Thanks for sharing. Rhodes wins every time. I don't think anyone in here would disagree! I certainly agree with goldphinga. Allthough there are some nice plugins like keyscape, premiumsoundfactory and e-instrument and scarbee will be releasing their new 88 big ep/Rhodes. They put a demo on their channel this afternoon. Sometimes it is really fun to play their old NI mk1 and wurly. Here's something I recorded recently. A cover of "By The Time I Get To Phoenix" featuring my Rhodes. I played Rhodes, guitar, bass, drums, and sang on this! Hi. New to the site. Been playing a Fender Rhodes since I was five. Thought a few people might be interested in some sound recordings? BTW - posting here, because the thread for people to discuss strictly MP3s/audio hasn't had a new post in 10 years??? https://www.youtube.com/watch?v=6qbB98hSB5I Hi, here's a video of playing a really professional electric piano solo on a simple 8-bar loop. This Ukrainian guy starts playing from 2:05. The most amazing thing is the way in which he rhytmically combines the left-hand chords and right-hand lines in each 7th and 8th bar of the loop. Could you please tell me, as Western musicians who know the styles of electric piano playing, who of the great American or British or maybe other performers played in a style comparable to his? What are the most probable artists who influenced this guy, in particular, in this solo? It seems like the solo has some Latin vibe in it, hasn't it? He uses syncopation, varies the rhythm a lot, which makes the solo groove. Where do the roots of this solo come from? The Fender Rhodes solo at 2:10 is great, absolutely love how well it was recorded. Really nice bell tones and funky rhythmic guitar underneath. I hope to record something with them soon!